The National Veterinary Laboratory is the oldest private veterinary diagnostic laboratory in the United States. We are a specialty veterinary diagnostic laboratory and provide tests for the feline leukemia virus (FeLV), the cat scratch disease bacteria, Bartonella, and the feline immunodeficiency virus (FIV). Please click on a link below to open up the PDF file. 1. Greene, CE, McDermott, M, Jameson, PH, Atkins, CL, and Marks, AM: Bartonella henselae infection in cats: evaluation during primary infection, treatment, and rechallenge infection. J Clin Microbiol 34:1682-1685, 1996. 2. Guptill L, et al. 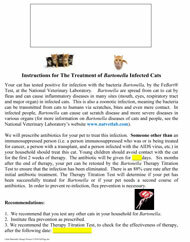 Experimental infection of young specific pathogen-free cats with Bartonella henselae. J Infect Dis 176:206-216, 1997. 3. Kordick DL et al. 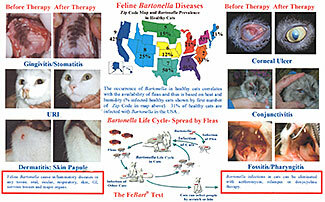 : Clinical and pathologic evaluation of chronic Bartonella henselae or Bartonella clarridgeiae infection in cats. J Clin Microbiol 37:1536-1547, 1999. 4. O’Reilly, KL et al. 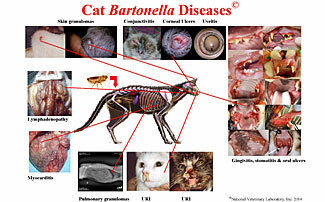 : Acute clinical disease in cats following infection with a pathogenic strain of Bartonella henselae (LSU16). Infect Immun 67:3066-3072, 1999. 5. 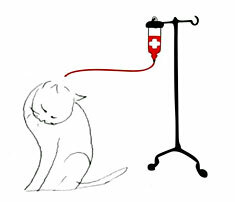 Mikolajczyk MG, O'Reilly KL: Clinical disease in kittens inoculated with a pathogenic strain of Bartonella henselae. Am J Vet Res 61:375-379, 2000. 6. O’Reilly KL et al. 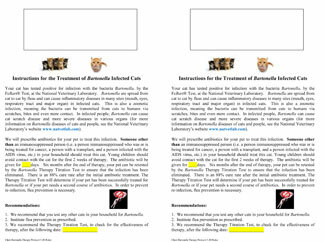 : Passive antibody to Bartonella henselae protects against clinical disease following homologous challenge but does not prevent bacteremia in cats. Infect Immun 69:1880-1882, 2001.